Your all-in-one strategy and communications platform. The new way teams create, collaborate on, manage and share visual, living documents and presentations. 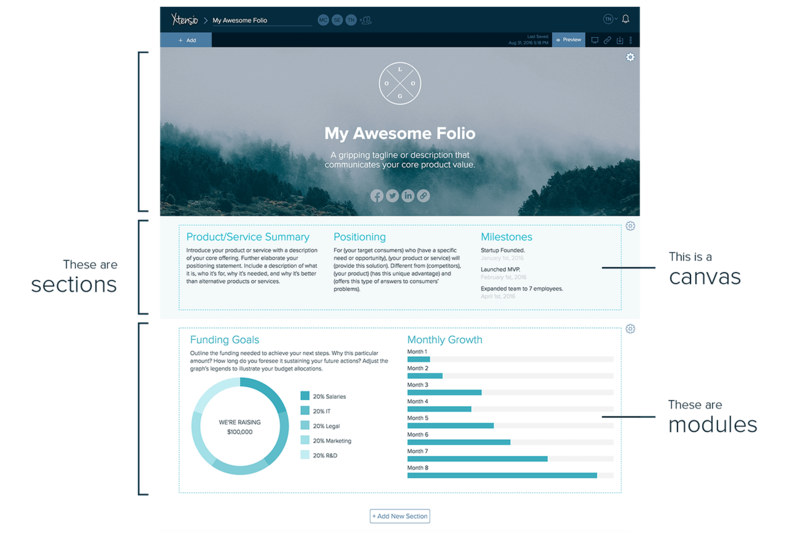 This is a folio: a web page, a digital slideshow and a PDF/PNG all-in-one. Your folios are responsive to all screen sizes. And all edits are automatically saved and synced across all devices. Format your folio into horizontal slides. Change the background color, upload full-width background images. Duplicate, export, share or delete. In presentation mode, each section is a full-screen digital slide. Control the layout with canvases. Change the number of columns and move modules in and out. Insert our pre-made lean canvas, business model canvas or user persona. Update the color scheme. These are your content containers. Pick from a handful of interactive modules. Drag and drop. Resize them to fit your needs. Add a background, change the color scheme, duplicate, share or export. By default, your folios and channels are completely private and secure. On the Business plan, you can add colleagues, investors and other key players to collaborate on your folios in real-time. You can also add team members and guests to collaborate on channels, so they automatically have access to batches of folios you’re working on together. All of your changes will automatically save and sync across all devices. Change access levels at any time. All updates are immediately synced with the live link. You can even add password protection (Business feature) or embed your work on your website. Present each of your folio’s sections as full-screen digital slides. Use your keyboard to navigate or the buttons at the top of the screen. Download your whole folio or individual sections and modules as a PDF or PNG. Customize your folio for print. This feature is available on premium plans. Manage your projects and collaborators with ease. Organize your folios into categories with channels. Add team members and guests as collaborators to give access to batches of folios. Share groups of folios with partners or clients on a customizable channel landing page. Control collaborator access level, view folio stats, duplicate or delete your folios from your dashboard. 589,464 folios created by 439,560 users. 0 folios created by 0 users. It’s very flexible and easy to use, making it very versatile and reusable across different product and market types. I use Xtensio, because it’s the best there is – elegant, competent and adaptable.